Home » Would you like to represent your local community? Would you like to represent your local community? Anyone interested in representing their community and becoming a local councillor is invited to attend a special meeting at Tamworth Borough Council next month where they can find out more about what’s involved. Preparations are underway for this year’s local election when 10 of Tamworth’s 30 seats – one in each ward - will be contested and prospective candidates for those seats are being encouraged to come forward now. 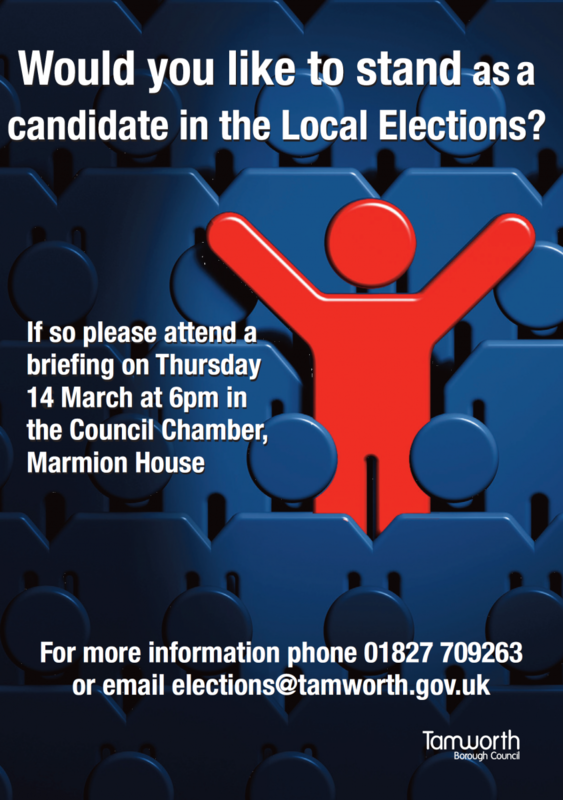 A briefing for candidates and agents takes place in the Council Chamber at Marmion House, Lichfield Street, on Thursday, March 14, at 6pm. The meeting will explain the election process and help potential councillors and their agents prepare for the election on Thursday, May 2. Prospective candidates will be given more information and nomination packs while election agents will be advised of their roles and responsibilities. Election agents are responsible for the conduct of their candidates, nomination forms and expenses. To stand for election, prospective councillors must be aged over 18, be either a British citizen, an eligible Commonwealth citizen or a citizen of any other member state of the European Union and be a registered voter within the borough and have lived, worked or owned property in the borough for more than 12 months. Nominations for this year’s local election will open on Monday, March 25 and close at 4pm on Wednesday, April 3. Election agents and candidates who would like to attend the meeting or who would like more information are asked to contact the Elections Office on 01827 709262/265, or email elections@tamworth.gov.uk. Residents are also being reminded that they need to be registered in order to vote. Registration is not automatic, even if a person is paying council tax or living in council-owned properties. Anyone who is not currently registered can register online at www.gov.uk/register-to-vote or can request a paper application by calling the Elections Office on 01827 709262/265 before the deadline of midnight on Friday, April 12. More information about the 2019 Tamworth Borough Council election is available at www.tamworth.gov.uk/elections-2019.